Wow! It looks quite different up close and personal!! you can see every brush stroke made by those clever decoraters. It's in the Tableware Gallery thank you mrnarna. Brereton after Jack Brereton the DIC chief buyer who suggested that CL copy the English Belle Fiore pattern . The second sample is the later production version with Pat. No 750.and a different backstamp. 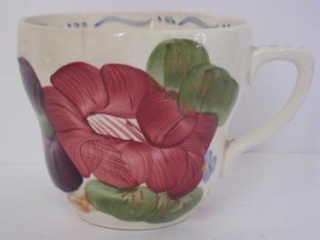 The Brereton version states that it is "Hand painted underglaze". Note also that the design has been reduced in detail. First produced in the late 1950's through to 1979. Ha! I failed to send the photos so will just send the original back stamp this time. A normal sized cup .... this just has the crown stamped on the base and Made In New Zealand around the little base. When I was a teenager my girlfriend's mum collected Carnival glass and Simpson's Belle Fiori. Despite an interest in glass, Carnival has never appealed. Neither did the Belle Fiori at the time. Many years later on a family visit to Wellington I found a Fleurette dinner set that was just too cheap not to buy. It has been stored in our attic for close on a decade, but with my revived interest in Crown Lynn, and a general purging of the unwanted and supplementing of the wanted has taken pride of place in the thru-cupboard that serves as both larder and pantry. The hand-painted flowers against a striking white background is something to behold. The set is not in daily use (we use the much hardier Pioneer and Redwood for that) but will be brought out for the odd dinner party. Table seats ten and we have 10 dinner plates. I have recently added some more cups and saucers and a tureen, which I had expected some competition for, on trademe. Best buys: two Cook & Serve cans on saucers (shop in Tauranga, also have two without). 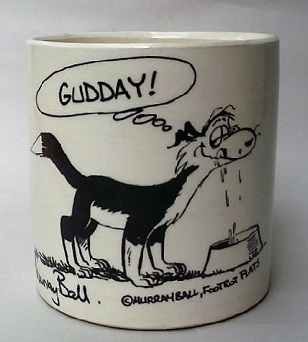 Saddest auction loss: Cook & Serve coffee jug which I gave up on at $130 some years back! 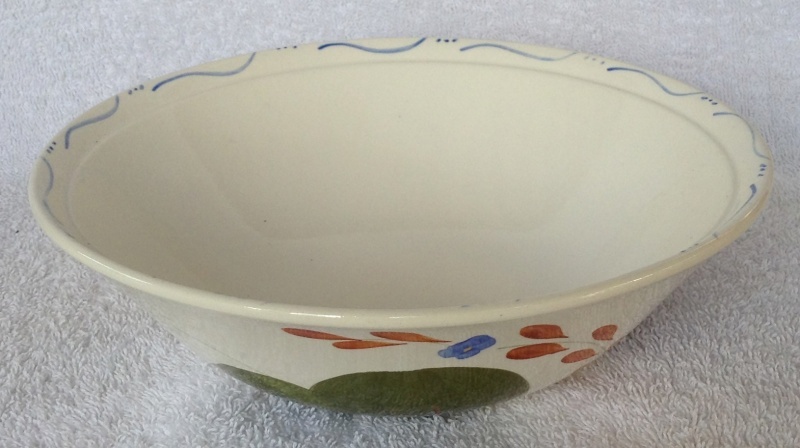 I would like to increase numbers of lunch plates and cereal bowls, swap a salt (have 2) for a pepper (have 0), get an older pattern of milk and sugar (have only Forma shape), and generally bolster the set, but they are all so expensive, in shops and on trademe. 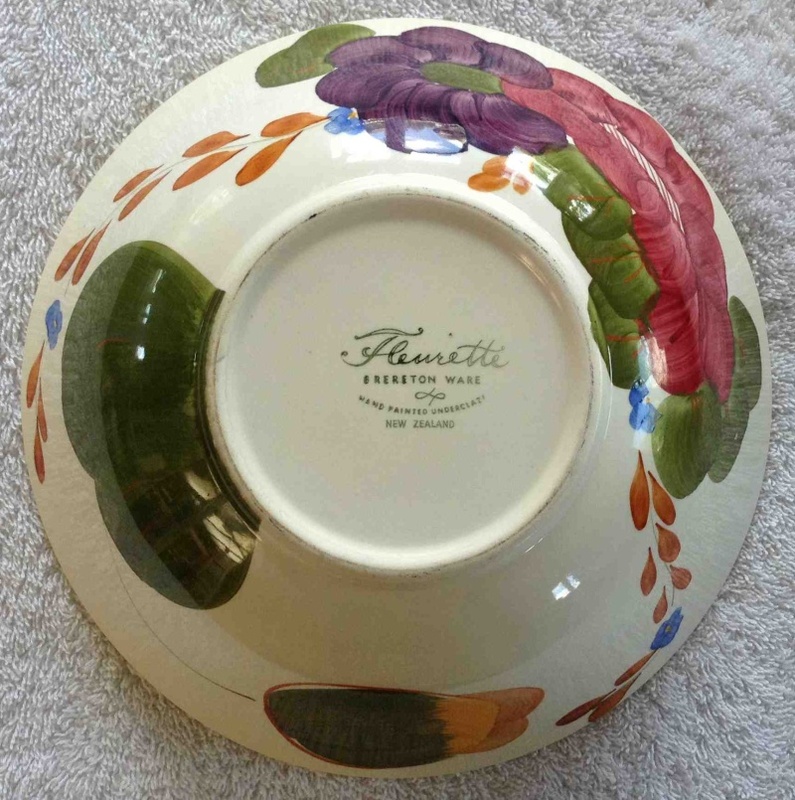 Perhaps Fleurette has some snob appeal considering its origins, or for the same reason is frowned upon as a blatant copy of the English china, but I do not see it as a "popular" collector's item. Maybe it's just the cost. Mine's in the older shape but even that has some variations. My two salt shakers are in the original shape, as above, milk and sugar are later. The newer stuff is safer for cleaning of course. I hate crazing (hence my preference for vitreous china), so I must take great care with temperatures, both for washing and storage. You think maybe some people find the bright pattern scary??? And an example of the coffee can is included in the Cook & Serve topic. Wow that is just stunning and I haven't seen one before in Fleurette!! Crown Lynn called that shape a Covered Scollop - Base 789 and Lid 708. I've merged a couple of cup shapes from another thread on Fleurette. Our Fleurette dinner set doesn't get many outings but a salad dinner on Sunday felt like a great opportunity. We ate off the dinner plates and used small ovals etc for serving. 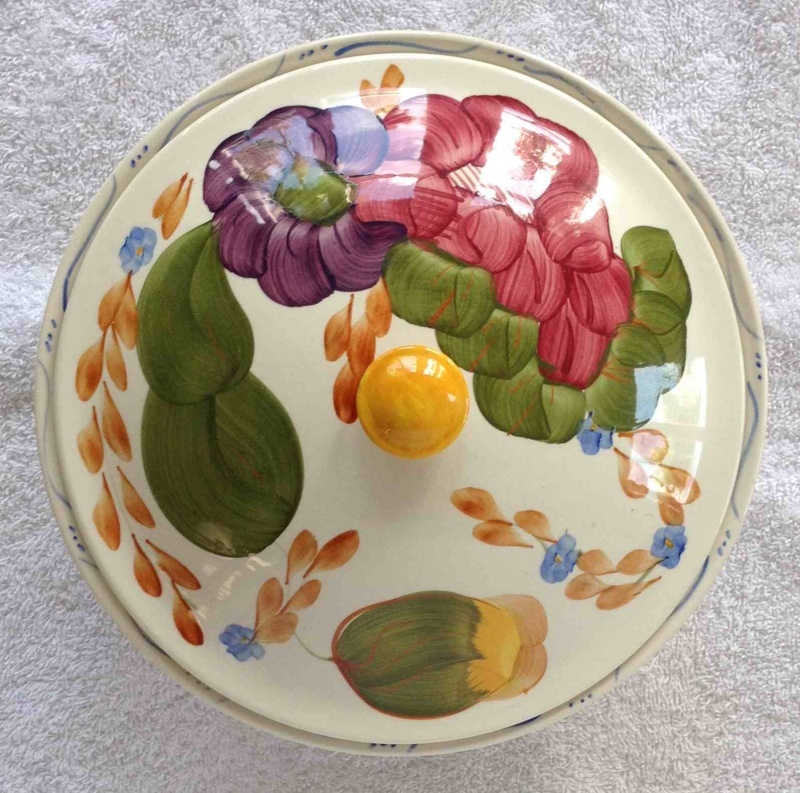 The most recent addition to the set is a lidded bowl or "tureen". It would have been great with salad greens in it but I totally forgot as I had it set aside for photographing. This tureen is effectively the same shape as a Colour Glaze salad bowl measuring 215mm OD by 69mm H without lid, with the addition of an inner rim to support the lid. It has no handles. 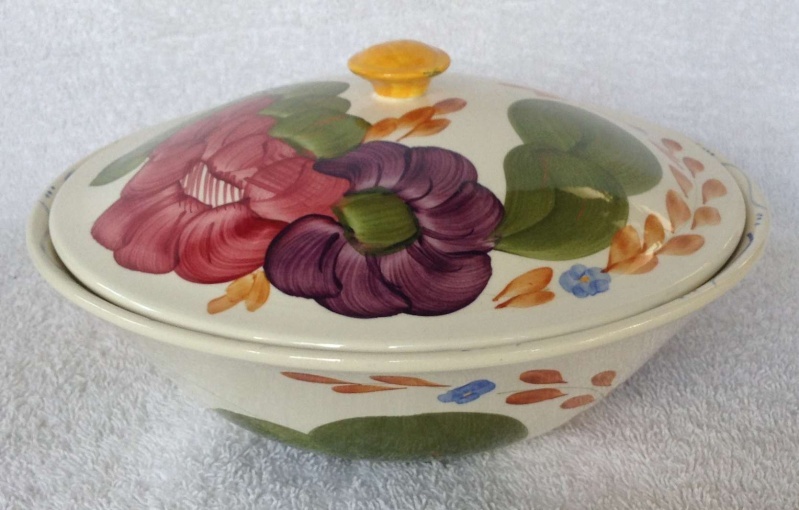 "Fleurette Brereton Ware Hand Painted Underglaze New Zealand". The mark visible on the knob is not damage, just a bit of messy paint. It's not just my photography: The base white here is less crisp than the rest of the set.